In popular literature on Buddhism it is often said that the Buddha did not address questions about the existence and nature of God because he considered such questions unanswerable or irrelevant to personal edification. Contrary to these assumptions, however, the Buddha’s discourses are perfectly explicit in rejecting theism, the doctrine that the universe is created and ruled by a supreme being. While the discourses affirm with theism the need for an objective moral order, they consider the idea of an omnipotent and omniscient creator to be a mistaken view formulated on the basis of faulty knowledge. The Buddha dispenses with the need for a creator god because in his cosmology, the universe is without temporal creation. From his perspective, sentient beings have been migrating from realm to realm through time without beginning, taking rebirth in accordance with their karma. The process occurs autonomously, without need for an external administrator. However, though rejecting theism, the Buddhist cosmos includes many classes of superhuman beings that possess attributes we would consider divine. Just above the human plane are the realms of the devas, beings of light who enjoy degrees of power, beauty and happiness far surpassing our own. Higher still are the brahmās, superdivinities who dwell in states of profound bliss and tranquility, reborn here as a result of mastering the meditative absorptions while in human form. The life spans of these beings dwarf our own, lasting from hundreds of years to thousands of world cycles. Like all conditioned things, however, even these divine beings are impermanent, bound to pass away when their karma expires. The most exalted of the divinities in the cosmic hierarchy is called Mahābrahmā, Brahmā the Great, who obtains his position through the superior merits he acquired in past lives, mostly as a human being. Mahābrahmā is the Buddhist counterpart of the God of theism, but he is not the omnipotent creator of the universe. Owing to his longevity, Mahābrahmā is prone to claim such a status, but from the Buddhist viewpoint this claim is delusional. Several suttas attempt to unmask this delusion, sometimes with biting irony. In the Brahmajāla Sutta (DN 1), the Buddha examines sixty-two views about the origin and destiny of the world, among them the belief in a creator god. According to the sutta, at the beginning of a new world cycle Mahābrahmā is the first being to reemerge. Finding himself alone and feeling forlorn, he yearns, “May other beings come here!” At once, through the ripening of their karma, other beings reappear. Brahmā then declares: “I am the Lord, the Maker and Creator, the Almighty, the Father of all beings.” And the beings newly reborn, seeing that Brahmā preceded them, accept him as their maker. But the Buddha, whose vision spans countless world cycles, knows that Brahmā is simply an unenlightened sentient being—long-lived, glorious and powerful, but still trapped in the round of birth and death. Sometimes the Buddha makes a personal visit to the celestial sphere to disabuse Brahmā of his illusions. On one occasion (MN 49), Brahmā boldly proclaims the “pernicious view” that his realm is permanent and eternal. Aware of his proclamation, the Buddha travels there and rebukes Brahmā for this “lapse into ignorance,” humbling him in a contest of psychic powers. On another occasion (SN 6:5), when Brahmā boasts about the splendor of his realm, the Buddha and four arahant disciples visit him and emit a radiance that surpasses Brahmā’s own glory. This feat compels Brahmā to give up his claim to be eternal. The Kevatta Sutta tells of a monk who, while sitting in meditation, ponders the question, “Where do the four elements cease without remainder?” Using his psychic powers, he travels through successively higher heavens seeking an answer, in each case without success. When at last he comes to Brahmā, the great deity boasts about being “the all-powerful Maker and Creator” but avoids addressing the question. The monk, however, insists until Brahmā finally confesses his ignorance and sends the monk back to earth to ask the only one who can provide an answer, the Buddha himself (DN 11). The creative function that theism assigns to God becomes superfluous for Buddhism because the principle of dependent origination removes the need for a creator. The Buddha explains “the origin of the world” as a perpetual act of creation that at each moment we perform ourselves, not as an event that occurs in time. The world, its origin, its cessation and the way to its cessation exist nowhere else but in “this fathom-long body endowed with perception and mind” (AN 4:45). Through our ignorance and craving we continuously bring the world into being, and by overcoming ignorance and craving we can bring the world to an end. The Buddha sees theism, at least in its more extreme forms, as potentially subversive to ethics. He contends that if God is the cause of all creation, he must also be responsible for the actions of human beings; thus, when people commit murder, theft and other bad deeds, ultimate culpability would rest with God (AN 3:61). People pray to God in the belief that God can cancel their sins and grant them divine life, but if this were possible, morality would be unnecessary. The Buddha argues that if one who acts immorally believes he can be redeemed through the power of prayer, he might just as well believe that prayer can lift a boulder from the bottom of a pond and deposit it on land. He insists that those who aspire to life in heaven must follow the path that leads to heaven: the practice of generosity, virtuous conduct and mental development. Those who act thus have no need for gods and prayer, for they will be reborn in heaven as surely as oil poured into a pond will float on the pond’s surface (SN 42:6). Why doesn’t Brahmā set his creatures right? Why does he so rarely spread his hand to bless? Why does he not give happiness to all? A powerful reason for belief in God is the yearning for a state of immortality beyond suffering and pain. Buddhism does not promise personal immortality in heaven as its ultimate goal, but it does offer temporary respite from the ordeals of human existence in the heavenly worlds, which can be attained through virtuous action and meditation, especially through the Four Divine Abodes: boundless love, compassion, altruistic joy and impartiality (MN 99). The ultimate goal for Buddhism, however, is not life in heaven but nibbāna, the state of supreme liberation beyond the round of repeated birth and death. This again depends on human effort in practicing the Noble Eightfold Path with its training in moral conduct, mental purification and insight. Belief in God is partly motivated by the need to venerate a being who embodies the highest qualities our minds are capable of conceiving. Buddhism too affirms this urge, as seen in the role devotional rituals play in the daily routines of monasteries and the annual cycle of Buddhist religious life. Buddhism, however, does not seek its object of veneration in the figure of a creator god but in the Buddha himself—the supreme embodiment of purity, wisdom, love and compassion. Thus, while the texts reject the notion of a creator god, they extol the Buddha as “the teacher of gods and humans,” as one who guides even the deities to ultimate freedom and blessedness. 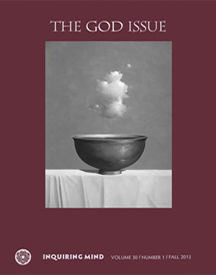 For further reading, see Buddhism and the God-Idea: Selected Texts, edited and introduced by Nyanaponika Thera, Kandy, Sri Lanka: Buddhist Publication Society, http://www.bps.lk/olib/wh/wh047_Nyanaponika_Buddhism-and-the-God-Idea.pdf.